Sibolangit two-colour waterfall is located in the village of Durin Sirugun, in the foot of Sibayak Mount, North Sumatra. Can be reached by traveling overland, crossing The Sibolangit Campgrounds. Mileage from Medan until Sibolangit about 75km, and from the Main Gate Campgrounds Sibolangit need 2-3 hours to arrive at two colors waterfall. A travel to two-color waterfall, you will come back refreshed because the forest landscape and the air are still fresh. Because of that, we can restore the freshness of our bodies from all fatigue. However, on weekends, this place is very crowded with local tourists. I suggest to come on Monday to Friday (not on holiday) if you want to travel there. When entering Campgrounds Sibolangit in Bandar Baru village, you can walk along the forest with hiking or leisurely walk for 3 hours, and to avoid getting lost, you must be assisted by local guides. Please sign up at checkpoints and you have to report into the guards if you wanna go into the two colors waterfall. The Sibolangit two-colors Waterfall with a height of 100 meters, sourced from Mount Sibayak, and the water which comes from the river on the top will be gathered in a small lake. The colors of the waterfall are light blue and grayish-white, because it contains phosphor and sulfur and can generate the light blue color. Because it contains sulfur, you are prohibited from drinking water from this waterfall. The preparation which must be taken before you traveled into the two-color waterfall should be considered before you take off. Shoes for hiking, drinking water and some clothes if you want to shower at the two-colour waterfall. Do not wear sandals usual, especially high heels! 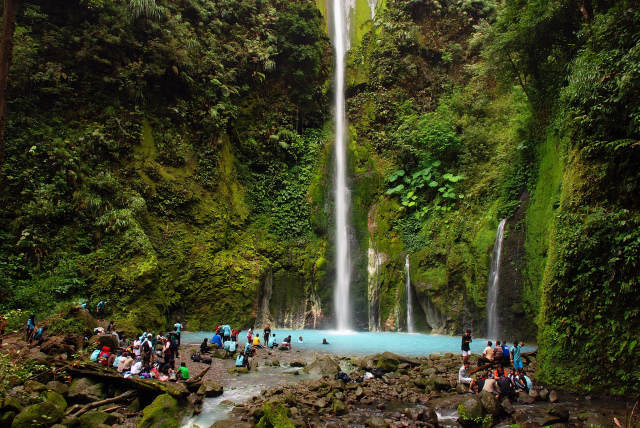 Waterfall of Two Colors also known as the Blue Lake Sibolangit.